Harper is going to break the bank when he signs. But when asked about it, he said, “Whatever people are talking about money, you can’t limit put a limit on players. You can’t put a limit on whatever they do. Whether that’s on the field or off the field. Don’t put limits on guys.” What does he mean by this? A lifetime supply and a blessing to do it in his old style. Maybe he could start an eye black company, and the Nats could promise to buy all their eye black from this company for 20 years or something. Bryce wants to make lots of money and not have himself limited? How about a stake in the team? An ownership stake seems easier on the team’s ability to sign other guys than some $50 M contract. There is also some evidence that players and ownership have a sort of unspoken agreement to limit the very best player’s salaries, and an ownership stake could look better, even if it gives Bryce more money. Plus, it would allow two owners to put on a uniform and shag flies! The Nats have yet to name the stadium, and this gives them the perfect opportunity. Bryce Yards and Nationals Park? Maybe too close to the stadium up the road. I’m good with Nationals Park at Harper Stadium. Or how about the Harper Dome? It’s got a nice ring to it… what do you mean there’s no roof? Hey whatever, it’s better than the inevitable Geico Stadium or PNC Park 2, isn’t it? While we’re on the topic of naming things, maybe the team should be renamed to get him to stay. How about the Washington Bryce’s? Or maybe the Washington Harpers sound better. As ridiculous as it may sound, this wouldn’t be unprecedented. And Harper is way better than Napoleon Lajoie. I don’t know, it’s Washington. Have you seen the people that are running for President these days? There’s gotta be some position to give Bryce. I’m cool with dictator perpetuo, but then he might not start showing up for spring training til March 16. The Nats have a chance to sign Bryce, but it may take more than money. 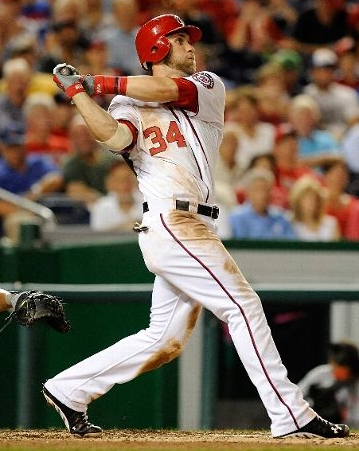 Bryce suggested to not put limits on players, so the Nats should take him at his word. Offer him more than money, and maybe he’ll be intrigued. You got any better ideas?